I must confess: I've never seen a single episode of The Simpsons. Of course since I don't live under a rock, I'm vaguely aware of Marge, Homer, Bart and the gang. But this is one pop culture phenomenon that has passed me by. 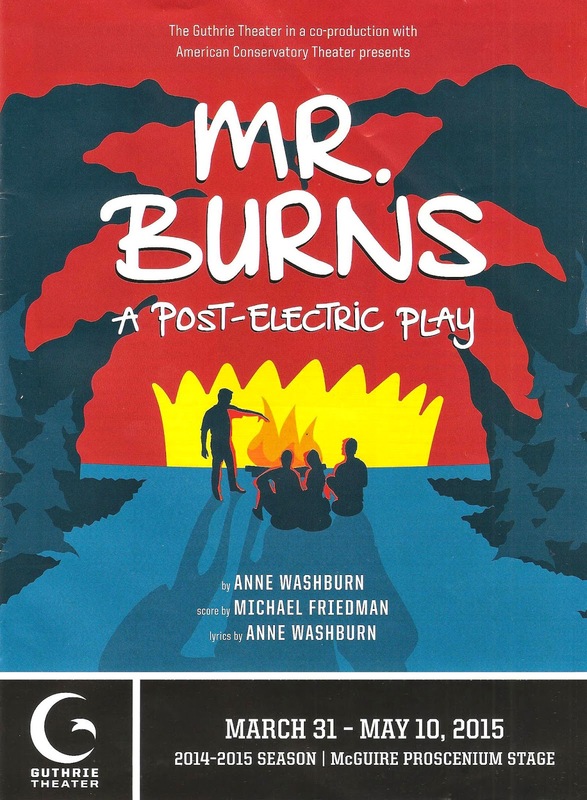 Even so, I can appreciate playwright Anne Washburn's play Mr. Burns, A Post-Electric Play, which uses The Simpsons to explore how pop culture survives after an apocalyptic event. While knowledge of The Simpsons might make the play more enjoyable (as evidenced by the people guffawing at every line in the row in front of me), it's still a fascinating look at survival and finding joy even in devastation. The play feels like it's made up of three very different short plays. The first act takes place shortly after the nuclear disasters happened, causing "the grid" to go down. We meet a group of survivors, who are entertaining themselves by reminiscing about their favorite episode of The Simpsons, "Cape Feare," even while brandishing guns to protect themselves from intruders. Think The Walking Dead, except that between killing zombies, Rick and company talk about TV (maybe they do, we just don't see those scenes). To continue with the TV references, the tone of the show is somewhere between The Walking Dead and The Last Man on Earth, because it's a bit silly, but with a real undercurrent of darkness as survivors ask newcomers if they have any news about their missing loved ones. In the second act, we jump forward seven years to a time when things are still pretty messed up, but there are traveling theater troupes that perform episodes from TV shows. And apparently theater too, but who wants to watch Shakespeare when you can watch The Simpsons? Our group has formed one such troupe, and is in competition with other troupes. The group has differing opinions about whether their job is strictly to provide a much needed escape in a bleak world, or to enlighten and engage on a deeper level. Before the matter is settled, we jump forward another 75 years, after an intermission during which the cast dons extreme and specific make-up to transform themselves into characters from The Simpsons. The last act is the finished product of what was begun 75 years ago - a musical that blends the story of the apocalypse with "Cape Feare." Mr. Burns is a bit of a hodgepodge, with serious, poignant, and very real scenes interspersed with the absurd - a music video montage of pop songs, a commercial for... something... that goes on and on, and the entire third act musical sequence. It's truly bizarro, but mostly in a good way. 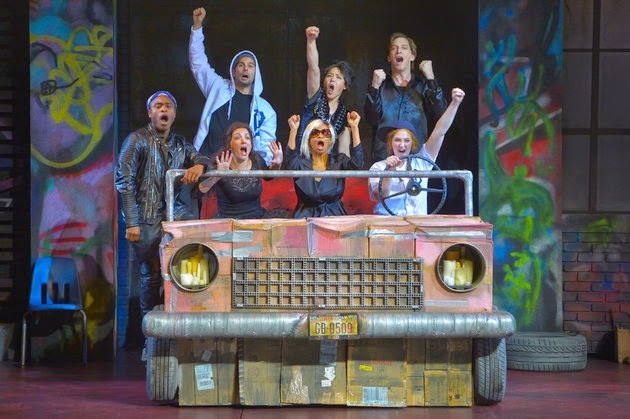 The original songs are great (music by Michael Friedman and lyrics by the playwright), and cleverly tie in several pop culture themes. And kudos to costume designer Alex Jaeger for covering the whole scope from apocalypse gear, to makeshift theater production, to amazingly bright and detailed Simpsons costumes for the musical. Because this is a co-production with San Francisco's American Conservatory Theater, I was expecting a cast of unfamiliars. So I was pleasantly surprised to see local favorites Charity Jones (a traumatized survivor turned director), Andrea Wollenberg (who beautifully carries most of the singing weight in the third act), and Jim Lichtsheidl (I don't now about you, but if I'm ever in an apocalyptic situation, I'd like to be trapped with Jim Lichtsheidl singing Gilbert and Sullivan). Combined with the non-locals, they form a tight cast that willingly and enthusiastically jumps in with both feet, whatever the script calls for. In particular, Ryan Williams French gives a deliciously evil performance as the musical's villain. Even though I'm not a fan of The Simpsons, and some of the references might have gone over my head, and some of the re-creations went on a bit long for my taste, Mr. Burns, A Post-Electric Play is no doubt incredibly creative and inventive. I'm sure if my TV were taken away from me, I'd search out anyone I could to discuss the finer points of my favorite episodes of The Office ("Booze Cruise" anyone?) or Game of Thrones. The apocalypse is a popular theme in pop culture, so it's quite fitting and fascinating to see an exploration of pop culture in an apocalypse. It's about how we tell our stories, whether that's through theater, or television, or around a campfire, or whatever medium is left when all the lights go out. Mr. Burns continues through May 9 on the Guthrie's Proscenium Stage.